first week of college?! + notw. i, along with many others, have started college! i started classes on tuesday. to be quite honest, i was really afraid to go to college and at a brand new school. but i kept telling myself that it was only for 3 days and that i didn't have to get up early anymore. basically things that wouldn't make me scared. and it worked! i made myself feel better. and it wasn't as bad i thought it would be. i expected the teachers to be...idk bitchy? but nope. i expected the same for the students, especially the older ones, but i haven't seen that yet. and the classes aren't as full as i expected them to be. probably because it's such a small school. i went to a local school, because of scholarship and cosmetology (soon! next year, hopefully) reasons. that and i didn't want to be away from my family just yet. ▪ element statistics, tues @ 3PM: it's a match class, so this will probably be my worst subject. and, the facts that there's not an actual teacher (it's via skype or something of that nature idk) will make this a lot more difficult for me. there are some people that i know from high school who are in the same class as i am, but i never really interacted with them, so it's basically the same as not having any friends. plus, the teacher actually uses all 2 hours and 30 minutes of class, so there will be no chance of me getting out early. ▪ public speaking, tues @ 6PM: i don't really have a strong fear of public speaking, but i also prefer not to. but the teacher seems really friendly. and he doesn't use all of the class time! so we will probably get to get out early! plus, i actually have friends and people i know in the same class. this class is also via the skype thing. but it's not as bad as the math. ▪ psychology, wed @ 6PM: again, the teacher's seems nice. and again, there's people that i know! i am real interested to see this class play out. but, i think that we will be using the whole class time? i'm not to sure since we didn't do much on the first day because most of the class didn't have a book to being lectures with. ▪ computer applications, thurs @ 6PM: i love computers and i think i'm pretty good with them, so this class will be fairly easy for me. sadly, there's no one that i really know in this class. but everyone, including the teacher, seems friendly and/or approachable. i also did my nails for college! i didn't something bright and fun to cheer me up. the nail tutorial i used is marc jacobs Daisy inspired nail tutorial by elleandish (aka janelle). 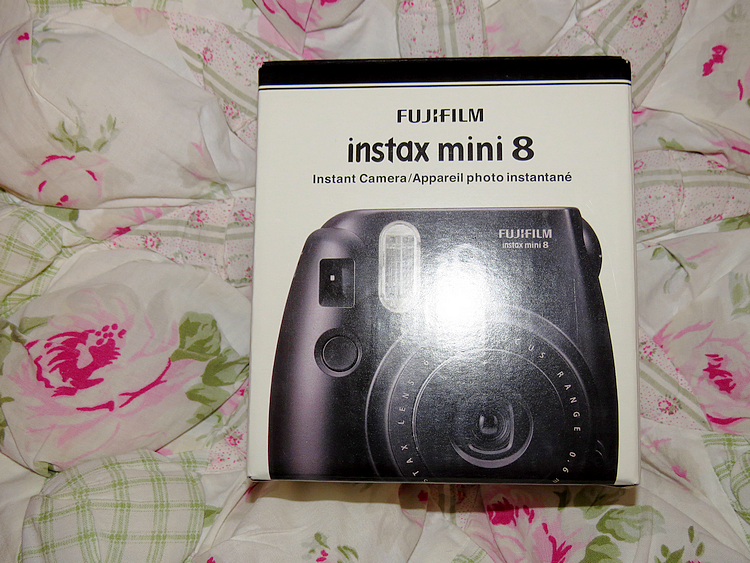 instax mini 8 (in black)! giveaway (CLOSED): thank you for following! this will be my first ever giveaway on this blog. i must apologize because the giveaway is so small. hopefully, in the future, that i can provide even bigger giveaways! now, i have been blogging for quite some time now. (since september 2008 omg.) and i have had many blogs throughout the years. i belive this is 2nd blog that i have kept up with for so lone! (the first one being my art blog that is currently on private.) i want to thank everyone that has followed me thoughout the years. it's been quite and adventure! but sadly, i cannot give each of you lovely people a prize, because i am just a poor student. :( but even so, i want to give something in return. so this giveaway is my way of saying THANK YOU! if you do not know what these japanese kits contain, i suggest you do your research. especially if you are a vegetation, as some of the kits do contain meat. i have bought some of the kits before, and yes, they are completely safe to eat. however, some of them may not be so tasty. reason: thank you for following! sept 19: giveaway has been extended one more week! sept 27: giveaway has ended is is now closed. thanks to everyone who has entered! ☆ if you have any questions, please send them to my ask.fm!